Nick Bjugstad, the smooth-skating, 6-foot-4, 180-pound Blaine forward with the NHL-caliber wrist shot, was named Mr. Hockey on Sunday, March 14. Bjugstad is a junior-aged student who accelerated his studies so he could graduate early. He is expected to be a first-round pick in June's NHL draft and play for Minnesota next season. 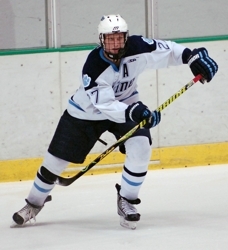 Bjugstad had 35 goals and 34 assists and almost singlehandedly led the Bengals to the state Class AA tournament, scoring two goals in each of Blaine's Section 5AA semifinal and final victories over Osseo and Maple Grove, respectively. Bjugstad, the newphew of former Minnesota North Star Scott Bjugstad, scored at least one goal in eight of Blaine's final nine regular season games. He scored two goals in each of the Bengals' three sectional playoff games before being shut out in state tournament losses to Apple Valley and Roseau. Bjugstad was presented with the award during the Mr. Hockey Awards banquet at the RiverCentre in St. Paul.